I'm still very much not feeling the love for swimming lengths, especially in a tiny pool like the one near work (17m, goddamit!) so I decided to drag myself to the pool today and do something different, to get the interest levels up - swimming intervals. So, 10 lengths warm up, 10 lengths at pace then 2 fast, 2 normal alternating through legs only, arms only, full crawl, full breast-stroke etc. In the normal pace lengths after the sprint ones I felt really strong, which was nice. Got a good old heart rate out of the sprint crawl lengths too, topping out at 177 BPM. And, the most important part was that I wasn't totally bored all the way through. AND I managed my usual mile in 32 minutes despite the arms only and legs only lengths and a couple of waits at the end of lengths to try to read my HRM watch to compare sprints with normal pace laps. 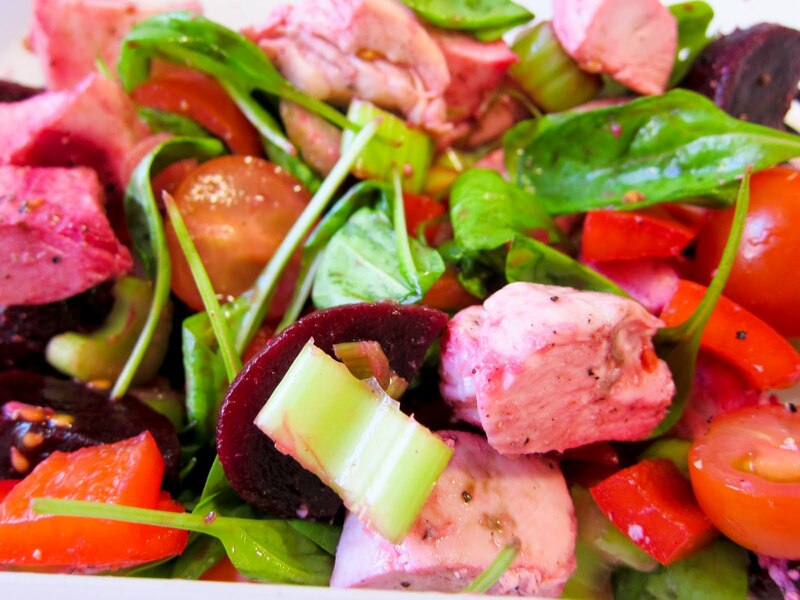 The spinach I've been growing in the garden was finally harvestable in a reasonable quantity last night, so I had some in my salad today (I love the way the beetroot turns the chicken pink!) and it was pretty nice, though it is still very delicate and less thick and crispy than the stuff you get in the supermarket, so I might let it get a bit bigger before I harvest any more. Snacks today were a bit more interesting than usual. Although I really really love carrot and houmous (apart from today's second carrot which tasted disgusting so I had to throw it away and spit out the first mouthful! ), I could do with a bit of variety to be honest. 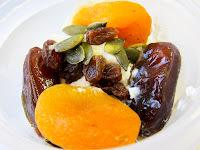 So this afternoons second snack was greek yogurt with raisins, apricots, dates and pumpkin seeds. Sadly, the pumpkin seeds didn't survive refrigeration with wet things very well and the result was chewy, soggy seeds. Otherwise it was a nice mix as the juice that seeped out of the dates added sweetness to the tangy yogurt. Yum!